Sen. Minority Leader Mitch McConnell, R-Kentucky, answers questions during his weekly news conference May 27. Editor's note: Sen. Mitch McConnell of Kentucky is the Republican leader in the U.S. Senate. Washington (CNN) -- Later today, I will sit down with President Barack Obama to discuss his request to increase the nation's debt ceiling, and I will make a request of my own: What, Mr. President, are you prepared to do about the massive deficits and debt that have grown dramatically on your watch? What Republicans want is simple: We want to cut spending now, we want to cap runaway spending in the future and we want to save our entitlements and our country from bankruptcy by requiring the nation to balance its budget. We want to finally get our economy growing again at a pace that will lead to significant job growth. The Democrats' response has been a mystifying call for more stimulus spending and huge tax hikes on American job creators. That's not serious, and it is my hope that the president will take those off the table today so that we can have a serious discussion about our country's economic future. The president claimed last week at a New York fundraiser that he is prepared to bring down the nation's staggeringly high deficit and debt by trillions of dollars, but rather than provide any details, he only listed the things he refuses to cut. This is a problem I hope to raise with him today. At some point, Democrats need to realize that the reason our nation's debt has skyrocketed 35% over the past two years is that government spending is out of control. America does not face a debt crisis because we tax too little, but because Washington spends too much. And tax hikes can't pass the Congress. Not only is there bipartisan opposition, the consequences of massive new tax hikes would be fewer jobs. The president spoke in his weekly address Saturday about wanting to help manufacturers create jobs. But we know that raising taxes on these same manufacturers, particularly in this economy, will have the opposite effect. The obvious solution is for Washington to make the kind of tough choices in its own budget that millions of Americans have been forced to impose on themselves over the past two years. Yet President Obama and his allies in Congress remain unwilling to concede the point. Once they get their hands on taxpayer dollars, they seem incapable of letting go. The $830 billion stimulus bill is just one example. When Democrats passed it, they made two predictions: first, that it would keep unemployment below 8%, and second, that it was a one-time cash infusion meant to prevent a wider crisis. Two years later, unemployment hovers above 9%, and Democrats now demand that we add new stimulus funding. Their commitment to spending and tax hikes is so deeply held, it seems, that they don't even recognize what terrible shape our economy is in and the fact that tax and spend policies of the past two years have made it worse. Nor do they seem to recognize that the voters are asking for a different approach. Americans didn't elect dozens of additional Republicans to the House of Representatives last November because they wanted their taxes raised. They sent them here to reverse the runaway spending policies that failed. Since the day the stimulus was signed, Washington has added $3.5 trillion to the national debt and roughly 2 million Americans have lost their jobs. More recently, a slew of troubling economic indicators and dire warnings from credit agencies about the dangers of our debt show that the time for serious action is now. We have seen the consequences of giving Washington a blank check -- and we think it's time Washington make some of the hard choices that the average American has made over the past two and a half years. 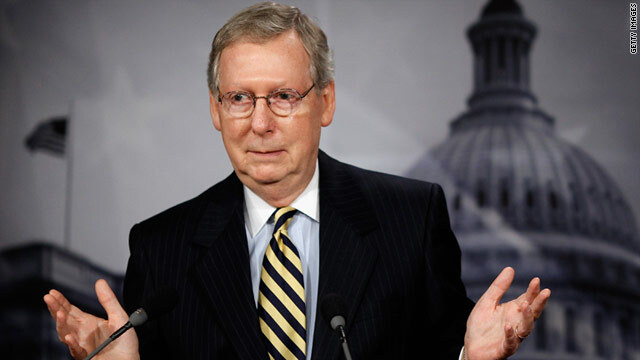 The opinions expressed in this commentary are solely those of Mitch McConnell.